-Selectable Main/Main or Main/Monitor power amp modes. The XR-S comes equipped with on-board digital effects and cutting-edge features that are only available from Peavey, such as MidMorph and FLS (Feedback Locating System). Additionally, the mixer includes Peavey's exclusive KOSMOS bass enhancement that adds low-end response and increases high-end clarity. The XR-S also features Bluetooth wireless connectivity for audio playback from any Bluetooth-equipped smart device or USB jump drive. Other features include an assignable Main/Main or Main/Monitor power amplifier with four twist-lock combination outputs. An on-board LCD conveniently displays the MP3 file name and play information along with selected effects. 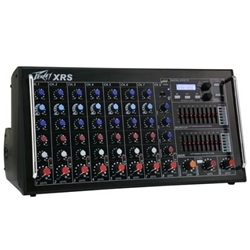 Featuring the rock-solid construction for which Peavey is known, plus a dual 9-band graphic EQs and a monitor send, the XR-S is the perfect sound reinforcement solution for audio professionals needing a highly reliable mixer in an economically sized package.